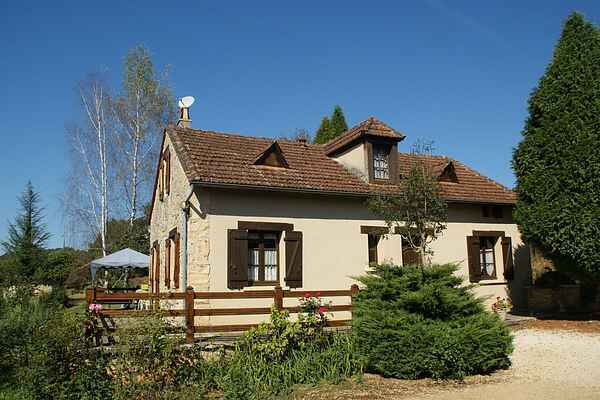 This detached house is situated in a lovely spot on the edge of Prats-du-Périgord. At this magnificent place you have access to a nice house with a terrace on three sides of it. You enjoy complete privacy and stunning views. The living room has a nice fireplace set and a beautiful, half-open wooden kitchen. Swimming is done in the shared pool, while the children play on the playground. About a hundred meters is a fishpond where you can freely vissen.Wandelen excellent here. The beautiful woods invite you to do so. Also you can walk to Prats-du-Périgord. Here you will find an old church, but also a good bakery for breakfast. This region almost bursting of the old medieval towns. Villefranche-du-Périgord (10 km), Monpazier (16 km) and Belvès (19 km) can not be beaten. Enjoy the French life of then and now. Quaint shops, beautiful streets and fine terraces make life aangenaam.Avonturiers enjoy themselves here too. Rent a canoe at Siorac-en-Périgord (22 km) to explore the Dordogne or visit the caves at Les Eyzies-de-Tayac-Sireuil (39 km).